Lucy and Snoopy are at it again! 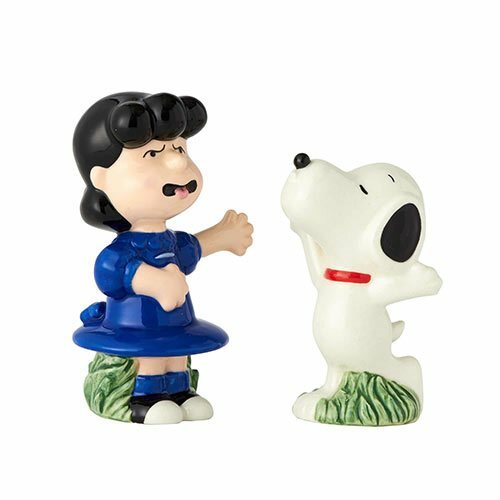 Bring the nostalgic flavor of Peanuts to your kitchen table with this colorful Peanuts Lucy and Snoopy Salt and Pepper Shaker Set. Handcrafted and hand painted to precision, the 3 5/8-inch tall ceramic shakers capture Lucy and Snoopy's hilarious love-hate relationship. Lucy sticks out her tongue in disgust, recovering from a sloppy Snoopy smooch! Fans of the comic strip will delight in this fun and practical gift.